Country Pursuit Premium Chicken & Rice Adult Dog Food is a complete and delicious recipe that's ideal for working dogs. Furthermore, it is also perfect for dogs suffering from stomach upsets and disorders or those with sensitive digestion. 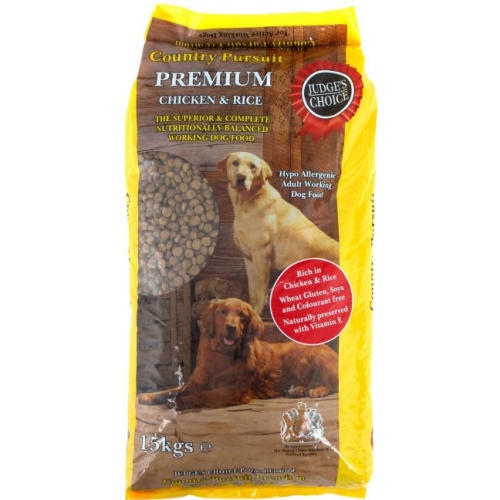 Country Pursuit Premium Chicken & Rice Adult Dog Food is loaded with natural anti-oxidants but contains no soya, artificial colourings and flavouring and is boosted with a full complement of essential minerals and vitamins. Pre cooked corn, Chicken Meat Meal (20%), Rice (16%), Barley, Fish Meal, Sugar Beet Pulp, Chicken Fat, Whole Linseed, Minerals, Sodium Chloride, Chicory, Yucca Extract. Crude Protein 23.0%, Fat Content 12.0%, Crude Fibres 2.5%, Inorganic Matter 6.0%.